We've totally updated every part of the book and added lots of new listings. We've even added resources in Northern New Jersey! 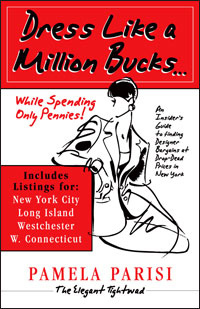 Whether your taste runs to Prada and Gucci or Banana Republic and the Gap, whether you want only the trendiest current season styles or are looking for a classic Chanel from the 40's, you will find the places to get them at drop-dead prices in this book. How about a pre-owned $2500 Fendi leather knapsack for $450, or a new $400 pair of current season killer Bettye Muller kitten heel pumps for $62.50? These prices are not out of the ordinary if you know where to look. Inside:Would you like an classic angora winter coat feathured in Oprah Magazine at $1100 for a mere $400? Perhaps a pair of hardley walked in Hermes pumps for $6. That is not a typo! These are not made up prices. Pamela Parisi, The Elegant Tightwad, has found them all on her many bargain shopping safaris. She is an expert at routing out the most fabulous clothes at the lowest possible prices. And now she will share her sources with you.